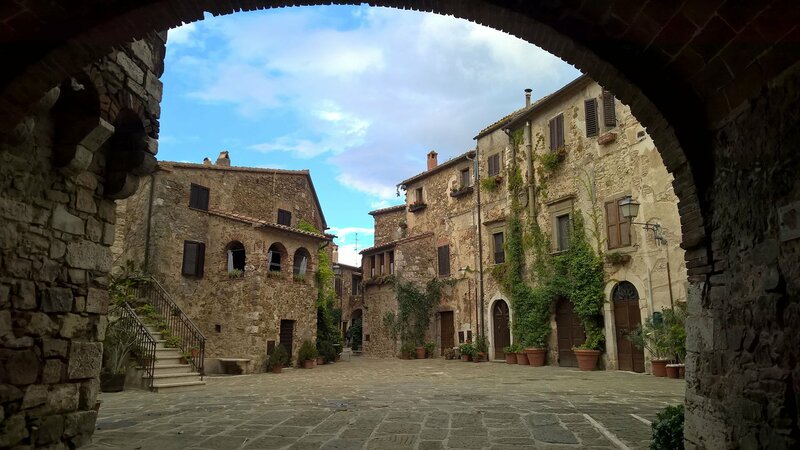 Montemerano is "One of the most beautiful villages in Italy" and one of the most famous villages of the Tuscan Maremma, an unmissable stop for lovers of history and art! Montemerano has ancient origins, built in the Middle Ages as a possession of the Aldobrandeschi family, the Baschi family, the Republic of Siena, the Grand Duchy of Tuscany and the Lorraine. Today in the streets of the village you can still breathe history, among its narrow streets, the ancient stone buildings, the arches, how to live a journey to discover the ancient centuries ... The artisan shops, the typical restaurants, the historic buildings and the views of flowered terraces, hidden squares and imposing walls make it one of the most particular villages in the area. A visit to the Piazza del Castello, the historic parade ground of the Castello di Montemerano, is a must, today a scene of events, concerts and events, the Church of San Giorgio, dedicated to the patron saint of the town, and the city walls, erected by the Aldobrandeschi and remodeled in the following centuries. Finally, the events, many initiatives throughout the year, from the Feast of St. George, with the palio and the launch of the Balloon, up to the Witch Festival, the evening of December 31, with many initiatives through the streets of the country that, for one night, it becomes the secret haunt of witches and ghosts ...! Montemerano is only a few minutes from the Cascate del Mulino. Montemerano is “One of the most beautiful villages in Italy” and one of the most famous villages of the Tuscan Maremma, an unmissable stop for lovers of history and art! Montemerano has ancient origins, built in the Middle Ages as a possession of the Aldobrandeschi family, the Baschi family, the Republic of Siena, the Grand Duchy of Tuscany and the Lorraine. Today in the streets of the village you can still breathe history, among its narrow streets, the ancient stone buildings, the arches, how to live a journey to discover the ancient centuries … The artisan shops, the typical restaurants, the historic buildings and the views of flowered terraces, hidden squares and imposing walls make it one of the most particular villages in the area. A visit to the Piazza del Castello, the historic parade ground of the Castello di Montemerano, is a must, today a scene of events, concerts and events, the Church of San Giorgio, dedicated to the patron saint of the town, and the city walls, erected by the Aldobrandeschi and remodeled in the following centuries. Finally, the events, many initiatives throughout the year, from the Feast of St. George, with the palio and the launch of the Balloon, up to the Witch Festival, the evening of December 31, with many initiatives through the streets of the country that, for one night, it becomes the secret haunt of witches and ghosts …! Montemerano is only a few minutes from the Cascate del Mulino.